Squats?! 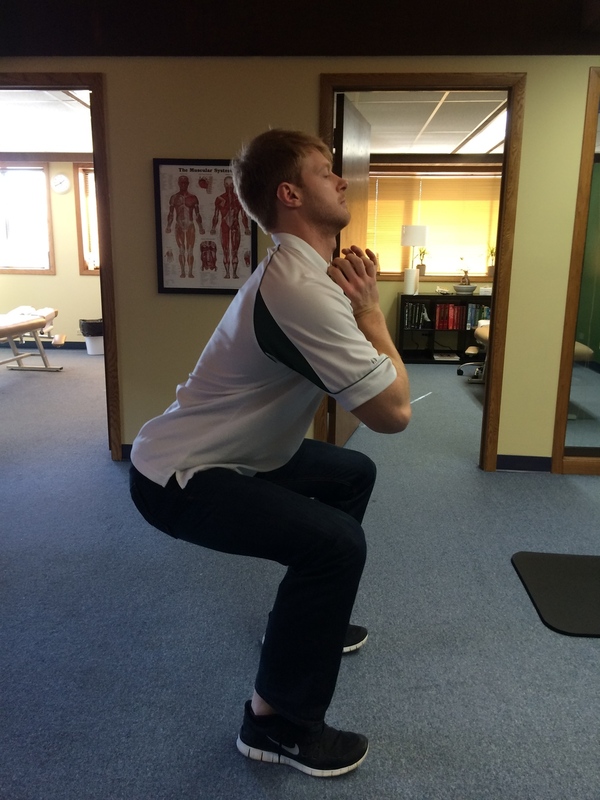 Naperville Chiropractor Takes Timeout to Discuss Importance and Proper Form. Ok. So we all hate them. Doing too many can make it feel like you just rode a horse 300 miles. What am I talking about? Squats. However the simple truth is that there is a tremendous therapeutic benefit to properly performing squats as well as one of the best exercises you can do at the gym. Squats recruit some of the biggest and most important muscles of the body. They burn more calories than most weight lifting exercises and will help burn fat in unsightly areas. So why do I as a chiropractor care about squats? 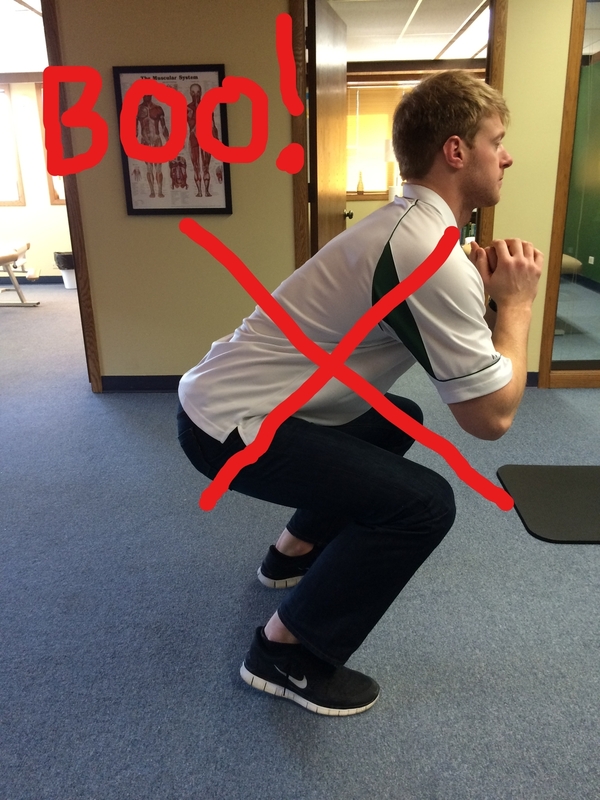 Squats, if performed properly, can help stabilize and strengthen an individuals low back and knees. It is a great tool that we utilize in our office constantly. The issue is that not many people have experience performing squats. So for those individuals I would like to discuss some easy tips to get you started. Tip 1: Start with body weight. Too often do individuals (gentlemen I am talking to you) want to increase weight before they work on the form of an exercise. Increasing weight too quickly can result in not getting the full benefit of the exercise, not properly engaging the correct muscles, and potential risk of serious injury. So if you are new to squats, or simply new to proper squat form, start with only your body weight. (believe me you can still achieve one heck of a workout with just your body weight. When performing a squat your goal is to get your hip crease slightly below your knees. In doing so your knees should never pass over your feet! If your knees move forward over your feet in your descent all of your body weight will transfer forward to the balls of your feet. This creates an immense amount of anterior shear on the knee joint and in time or with heavy weight could potentially cause serious injury. Ideally you want your knees to stay right above your feet as your rear-end makes the descent to slightly below parallel. In this position you should feel all of your body weight distributed through your heels. You know you are moving in the right direction if you feel like you are falling backwards. As a chiropractor I am constantly talking to my patients about low back safety and positioning. When it comes to performing a squat you want to make sure that all the work is being done with your legs and not your back. As you lower your body down you want to maintain the natural curve in your lower back. This is done by keeping your chest up and not letting your back round out. If you have trouble with keeping your chest up a simple fix is to put a mat that is 1/2" to 1" thick under your heels. This will elevate your heels allowing your ankles more mobility to help keep your chest from falling forward or collapsing. Once you have this down try reducing the mat size or try it with no mat at all. Click this link to watch a video discussing proper squat technique. And as always if you are limited in your daily activities or exercises due to what you feel is lower back, hip, or knee pain CLICK HERE to schedule an appointment and exam at our Naperville office with one of our chiropractic sports specialist.